Wildwood in Peterborough City Centre. 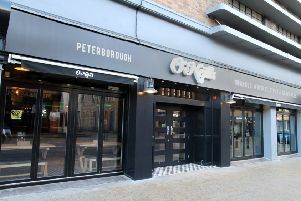 The proliferation of restaurants in Peterborough city centre is well documented. Barely a few months go by without a new restaurant opening in the thriving eating out area on and surrounding Cathedral Square. Wildwood was among the first wave of restaurants and has a prime spot facing the fountains (when they are on, course). Since then several more restaurants have opened which must make the competition for the diners’ dollar very fierce. It should be all good news for the punter as the competion drives up standards and keeps prices competitive. Well, that’s the theory anyway but perhaps that’s not the reality, because my experience at Wildwood was very disappointing. To put that into context I should add that I reviewed the restaurant glowingly shortly after it opened and so enjoyed it I have been back there several times in a private capacity. We went on a wet, Monday lunchtime but whilst not packed had a healthy number of covers. The decor is functional but stylish and modern and the whole place has a pleasantly informal and friendly atmosphere. Seen to our table by a helpful member of staff – we had baby with us and a pram to manoeuvre – we sat down anticipating an enjoyable lunch. For starters I went for the calamari (£5.75). The rings came battered with a cajun mayo for dipping. The batter was decent and the mayo had enough flavour to compliment without overpowering. The squid was a bit hit and miss, with a few of the pieces of the decent-sized portion stepping over the line from succulent to rubbery. My wife opted for the prawns (£6.50) for which she had no complaints and the spicy tomato sauce had a pleasant texture and some welcome heat. So far, so good but the main course was a huge let-down. I went for the peri peri chicken with fries and mayo (£12.75).What was immediately noticeable was the portion size - two smallish pieces of chicken and small bucket of fries. Even if it had been cooked perfectly, it would have struggled to have been value for money. Sadly, it wasn’t - cooked perfectly that is. It was overdone, rendering the chicken very dry and so dense that even dipped in the tangy mayo was not the easiest thing to swallow. It had plenty of the cooking heat but not enough flavour heat. No problems with flavour for my wife’s sirloin steak which came with fries and rocket and a gorgonzola sauce(£15.50). However, it was rare going on blue in places rather than the medium rare ordered and was far too gristly which meant chunks were left uneaten. We raised the problems with our waiter, who as he had been throughout, was pleasant and attentive. His apology was fulsome with a promise to pass on our feedback, although there was no offer of knocking something off the bill or a free drink. Instead he suggested we contact head office to tell them of our experience. Everybody has off days, and chefs and restaurants are no different to the rest of us, and I hope this was the case for Wildwood because working in a crowded market it needs to be on top of its game. The bill for two courses for two people with a beer and a soft drink was £46.10. For that I expect much better.